After all the blogs on church decline I felt I needed to write on something more positive. Not that I am negative about the future of the Christian church. The Lord Jesus promised that his gospel would cover the earth before his return, and he said the gates of hell would not stop him building his church. So atheism, humanism, and the like, have no chance ultimately, whatever passing problems they cause the church at present. The way Jesus builds his church is by pouring out his Spirit, often called revival. I live in Wales, a place that has had many revivals in the past. I am sure we would have them again if churches took the concept seriously, but sadly they don't. One reason revivals may not be high on the agenda is that people don't believe they are real. They read the stories, perhaps getting excited by them for a short while, but rarely look at the hard numerical evidence to validate their effect. They remain just stories. I have recently shown how one Welsh denomination grew faster than the population for 130 years, through revival and conversion . I will soon show the same for the Wesleyan Methodists . In each case decline set in when revival ceased. But I wonder if the national scale of these revivals is too big and impersonal to bring them to life. To help make revival more personal I will look at some congregational membership figures from the Rhondda Valleys around the time of the 1904/5 revival. I will focus on the Ystradyfodwg area, which includes the communities of Pentre, Ton Pentre, Gelli and Ystrad. The best membership data is for the three main Welsh non-conformist denominations at the time: the Calvinist Methodists, the Congregational and Baptist [3,4]. The three denominations had 18 congregations between them. This may seem a large number, but the area was very densely populated. Before the days of widespread public transport people expected to walk to church, and to one in the language of their choice, Welsh or English. Hence some duplication. Although there were a variety of denominations, providing a level of competition, the evidence from history books, newspapers, and the memories of older people was that the churches cooperated and were friendly to each other. Nothing like the stereotyped image of division and protectionism that is often portrayed in the popular media. The Calvinist Methodists, also called the Presbyterian Church of Wales, had five congregations in the area , table 1. 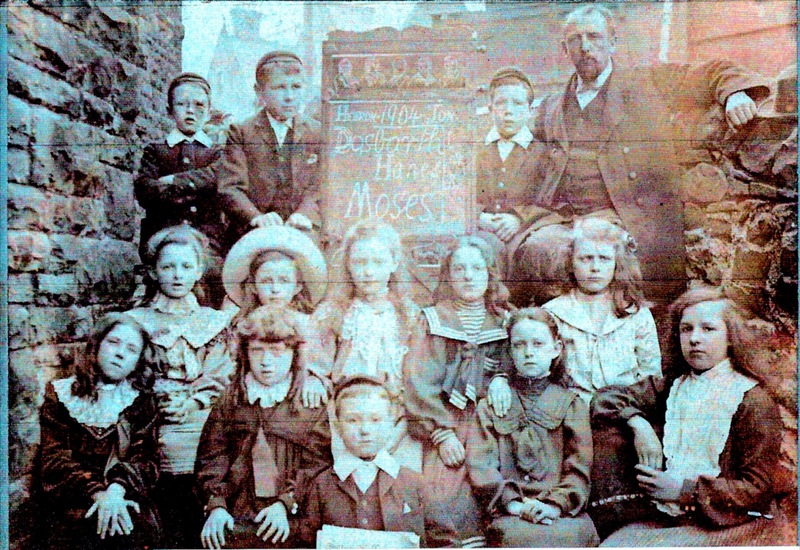 Four were Welsh speaking with the one English-speaking church started between 1891 and 1901. Between these dates the five churches grew by 2.1% per annum, largely thanks to the new church in Gelli. Compare this with the period covering the 1904/5 revival and the same churches grew by an average 6.6% per annum. This shows the massive effect of the revival on membership, and is in line with the national denomination’s growth during the revival . The church with the largest increase was Duffryn in Ystrad, with a 9.5% annual increase. However all the churches saw significant membership growth due to the revival, the lowest being 4.7%. This compares with a typical annual increase of 0.3% before the revival. Revival is real – there were many converts. The congregation with the largest numerical increase was Jerusalem in Ton Pentre with 139 added. It is worth noting that by 1911 there was little change in numbers. Membership in the Calvinist Methodists was still quite strict at this stage, and new members had discipleship classes. It took the First World War and the industrial decline of the twenties and thirties to undo the effects of the revival. Despite this decline the sum of the five congregations were still only at 1891 levels by 1937, a testament to genuine conversion. The Congregational church, also known as Welsh Independents, or Annibynwyr, had four Welsh-speaking congregations , table 2. Additionally there were two English congregations, one started in 1891. Sadly there is no data for 1891, but the six churches grew by an average annual 6% over the revival period. Only one congregation took a hit and declined. Perhaps they lost people to the new church in Ton Pentre that went from nothing to 246 during the revival period, the largest numerical increase of them all. Although Bryn Seion in Gelli had the largest percentage increase, they were unable to retain their numbers by 1911. One of the effects of the revival was the emergence of new churches; largely mission halls and Pentecostals. Often new converts who had “caught” the revival found the established churches hard to belong to. The worship lacked emotional expression. Such enthusiasts found a better home in the newer churches where worship allowed more freedom. The Baptists had seven churches in the area, three in English , table 3. There were two Baptist denominations, largely reflecting the language split. The data clearly indicate the biggest effect of the revival is with the Baptists, with the annual rate of 0.2% rising to 11% per annum over the revival period. One small church, Hope in Gelli, added 184 people, a 38% annual increase. I suspect that raised some interesting pastoral care issues, which perhaps accounts for some falling away afterwards. But again it shows the massive numerical impact of the revival. One church here is of personal interest. The pastor of Hebron Baptist in Ton Pentre was my wife’s great grandfather, the Rev EW Davies, figure 1. Her grandfather, Griffith, was in the Sunday School at the time and also went on to be a Baptist minister himself. Figure 1: Rev EW Davies (my wife’s great grandfather) pastor of Hebron Baptist, Ton Pentre. Her grandfather is the small boy top left. 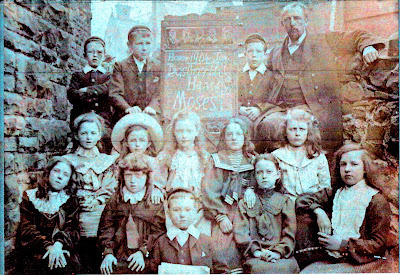 The photo is in the year the revival started, with a small selection of the 200 strong Sunday School. Stories have been passed down in the family of services that EW Davies took in the mines during the revival; making converts at the coalface. There are also stories of members and deacons who had been bad boys in the village until EW Davies had persuaded them to follow Christ and join the church. These are people who kept the faith and worked in church to the end of their lives. They were ever grateful to him for being bold enough to confront them in their former lives. But that is what revival does; it gives Christians boldness. Revival is definitely real! Real people, real conversions. God moved, and history shows the evidence. I could show a similar pattern across all the regions of the Rhondda Valleys. One church I preach in, Noddfa Baptist in Blaenclydach had 304 in membership in 1901, with the revival adding another 160. These days, in a different building, numbers are more like 10 to 15, yet still a lively church. Noddfa is one of the survivors. Look at the last column of each of tables 1-3 and you can see that of the 18 churches in the Ystradyfodwg area of the Rhondda only 3 are still open in 2016. The Calvinist Methodists, the drivers of the revival, are wiped out completely. A small number of other churches have opened since that time, I can think of two in this region. But in the hundred or so years since the revival Christianity has been decimated here, and across Wales. Why? The 1904/5 revival was the last one to occur in Wales. Indeed as I have shown elsewhere, it was a revival out of time . The long period of revivals really ended in the 1860s and the churches had been losing ground since the 1870s. The absence of revival has been the cause. That is the absence of the widespread outpouring of the Spirit. This led to reduced conversions, giving a slow decline through death and demographics, the two forces revival had made the church robust against. But the church got too clever, preferring the things of this world to the eternal hope that God gives, and worldly churches have insufficient recruiting power to build a church . The one comfort we can take is that God has not gone away; neither has his desire to pour out his Spirit. The revival period that started in Wales in the 1700s did so from a much lower base than we are in at present. If his people humble themselves, pray, seek his face, and turn from their wicked ways then, in his time, he will bring revival . And as I have shown, revival is real, people will be converted, churches will be built up, and the valleys will again sing the praises of Jesus Christ. Forthcoming blog on the rise and fall of the GB Methodists using the institutional model of church growth. The Wesleyan Methodists only have data for one year, and the Anglicans provided no breakdown of data for different congregations. Thus they are excluded. Kidger, Margaret E, (2012). Colliers and Christianity: Religion in the coalmining communities of South Wales and the East Midlands c1860 to 1930s with a particular focus on the Rhondda Valleys in South Wales and the Hucknall and Shirebrook areas in Nottinghamshire and Derbyshire. PhD Thesis, University of Nottingham. Kelly, Dean. (1986). Why Conservative Churches are Growing: A Study in the Sociology of Religion. Mercer University Press. Very interesting. We need to be prepared to disciple and walk alongside new Believers so that they stay alive in their faith and continue growing closer to God. Your wife certainly has a rich Christian heritage.